In this worksheet students are able to explore a variety of feeding relationships including food chains, webs and pyramids as well as looking at adaptations that predators and prey have to catch prey or to avoid capture. 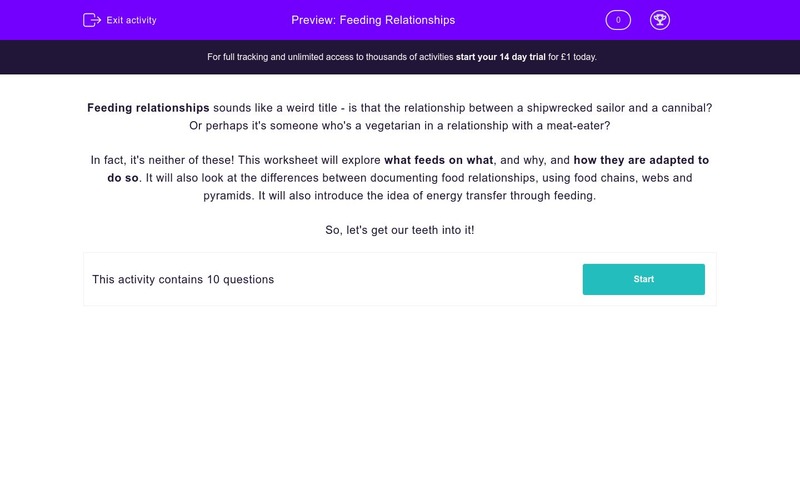 Feeding relationships sounds like a weird title - is that the relationship between a shipwrecked sailor and a cannibal? Or perhaps it's someone who's a vegetarian in a relationship with a meat-eater? In fact, it's neither of these! This worksheet will explore what feeds on what, and why, and how they are adapted to do so. It will also look at the differences between documenting food relationships, using food chains, webs and pyramids. It will also introduce the idea of energy transfer through feeding. So, let's get our teeth into it! First of all let's look at some differences between the predator and its prey, thinking about birds and mammals in this case. Predators and prey have different adaptations which are specific to them, and some adaptations which they have both developed. Below is a list of adaptations. You need to drag PREDATOR, PREY or BOTH next to each one according to which you think that adaptation applies to. If you can't see the whole sentences in the boxes on the left, hover your mouse over them. 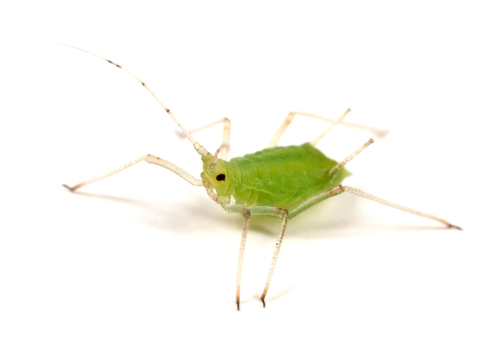 What is the name given to an organism that manufactures its own food? What name is given to an organism that feeds on animals? A good way of showing 'what eats what' is to place them into a food chain. Match each organism to its correct place in the food chain by dragging it next to its feeding description. You chose one of the animals in Q4 as a secondary consumer. Which ONE of the following is NOT a correct way of describing its feeding relationship in this food chain? What is the importance of the arrows in a food chain? This animal eats caterpillars, woodbeetles and snails and is preyed on by the hawk. Use the food web above to work out which animal this is. What is the TOTAL number of food chains (including the one above) that you can find in the whole food web? If an insecticide was sprayed on a nearby field but was blown by the wind into this oak tree, which organisms might be AFFECTED (note that word carefully!). One further way of showing feeding relationships between organisms is to use a pyramid of numbers. One of the organisms forms the foundation on which the pyramid is built and on which it depends. Which organism is that? Some of those were quite tricky! Predators often have sharp claws to capture prey, forward facing eyes (good for judging distance) and mammals have canine teeth for holding on to prey and ripping flesh. Prey, on the other hand, need to be aware of attack and often have side-mounted eyes (like sheep), giving them a brilliant field of view. Both of them often use good camouflage and excellent senses either to capture prey or to attempt to avoid capture. A producer is the 'food chain' name given to plants, because they photosynthesise and make their own food (which feeds the food chain) from sunshine and simple chemicals. An organism that feeds on animals must be a carnivore - that is a meat-eater, like a tiger, a spider or a jellyfish. So, the algae makes the food by photosynthesis (producer) and it is fed on by the tadpole (so that's a herbivore) which, in turn, is eaten by the stickleback (so that's the second consumer, a carnivore). Finally that is eaten by the pike and, as nothing eats it, it is the Top Predator. 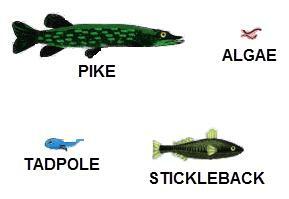 The stickleback is the secondary consumer in this food chain: it feeds on the tadpole (carnivore/predator) and is fed on by the pike (prey) so it is NOT an omnivore (eats plants and animals). The arrows in a food chain are all about energy: the producer makes the energy that feeds the food chain and the arrows are simply showing the transfer of that energy from organism to organism. 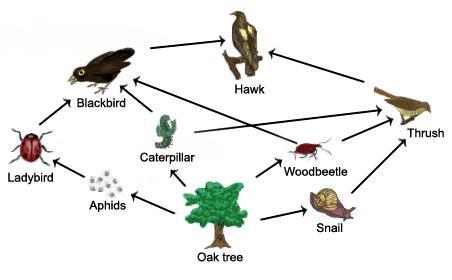 If you follow the arrows from the snail, the caterpillar and the woodbeetle you can see that they all go to the thrush which is then eaten by the hawk. If you count carefully you can see three going through the blackbird to the hawk and another three going through the thrush to the hawk - that's six in all. 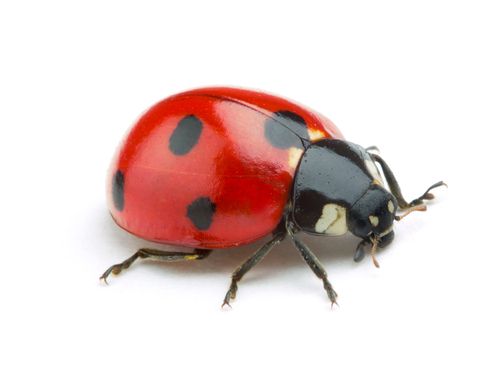 So, the insecticide is an insect-killer: that takes out the beetles, caterpillars, ladybirds and aphids. The birds would definitely be AFFECTED by this because their prey would almost disappear, so they'd need to move to a different part of the wood that hadn't been sprayed. The snails would not be affected, as they are not insects and they don't feed on them. 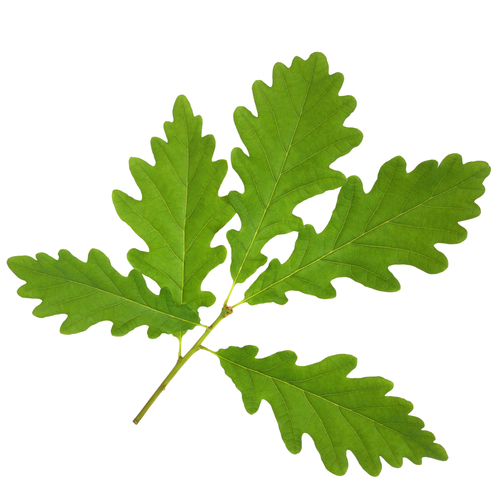 The tree would have fewer animals feeding on it, so more leaves would appear without being scoffed! Remember that the producer makes ALL the energy that feeds the food chain? So then, it must be the foundation for the whole thing - that's why it is called a producer - it produces all the food (in a way, it produces the food chain itself!). Later on we'll explore the significance of the pyramid and why it takes so many plants to feed 10 rabbits.